Diazoma" homepage. Snapshot published with kind permission of "Diazoma". Archaeology is an interdisciplinary science, as it is a scholarly study of past processes that often combines space, place, natural science, materials and texts in its interpretation. Presently, the majority of practicing archaeologists include digital tools in their work (e.g. data keeping, digital mapping, visualization tools). And recently, digital visualization is trending beyond 3D modelling and landscape reconstruction and into the interactive, scientific visualization of data in order to render relations between geographies and cultures, sensory properties (Betts 2011, Betts 2017, Foka and Arvidsson 2016), external /internal networks and aerial visualizations. On an international level, we have come to speak of the notion of “cyber-archaeology” (Forte 2015): archaeological methods that utilize participatory technology to interact with past artefacts and spaces and to understand the past through reflection and cooperative efforts. Current digital tools and methodologies help capture and display knowledge about the past. While there is considerable room for improvement, both in terms of tools and of methodologies, from composing plain databases to visualizations intended for wider museum audiences, we address here the current progress within Greek archaeological practice and emphasize the importance of sustainable and updated digital research infrastructures in order to enhance access to materials for researchers and laypeople alike. Within the larger European frame, Greece, like other countries, is attempting to upgrade its own digital research infrastructures. As openly discussed in the Greek popular press (Kathimerini, July 2016 (note 1)), Greece has been slower in digital innovation in comparison to other European countries, yet still, has managed to climb to number 48 out of 122 ranked countries in 2007. In terms of actual “Hellenic” archaeology, that is artefacts found, catalogued, and curated locally, the archaeological material itself (quality, quantity) and its previous curatorial practices, from inclusive of “whitewashing” and insensible transportation (see Hamilakis 2007) during times of war and occupation, complicate the legacy of Hellenic archaeology. Consequently, there is a deep need for a defined national policy in terms of digitization and consequent curation. With these facts in mind, we attempt a survey of digital tools and methods used so far in order to catalogue and to open up Hellenic artefacts for researchers and citizens alike. Furthermore, we offer suggestions for the future. The breakthrough event for the digital categorization and cataloguing of artefacts in Greece was funding from the European Union in 2000. Its implementation was carried out through the Ministry of Finance in the context of the 3rd Operational Programme (thereon O.P.) Information Society (H Κοινωνία της Πληροφορίας, note 2), in the beginning of the second millennium (2000). The O.P. promoted the study of Information Technology in secondary education, local service providers and all public institutions, including higher education: universities and the Archaeological Service, via the Ministry of Culture. From 2007 to 2013, the programme operated as Digital Conversion (Ψηφιακή Σύγκλιση, note 3), again, funded by the European Union. Through Digital Conversion, Greek state authorities envisioned and initiated an enormous undertaking aimed at digitizing Greece’s material culture through the centuries, including 14.5 million “unrecorded antiquities”. The task’s initial phase is known as the Polemon Project (2008) however, using a dated database developed during the 1990s. The project was resumed in 2012, following the development of a new type of database, which allows the support of millions of entries. This effort is still in progress, under a new O.P., Competitiveness, Entrepreneurship and Innovation 2014-2020 (note 4). In that framework, the authorities aim: a) to document, digitize and finally add to the National Monument Archives about 500,000 portable monuments, for many of which there is no documentation or photographic material; b) to update and upgrade the Information System of the National Monument Records and finally c) to add to the system 140,000 portable monuments digitized under the project Digitisation and Digital Documentation of the Collections of the Hellenic Ministry of Culture of the 3rd CSF, as well as any other portable antiquities digitized through other projects, in order to finally end up with a single digital inventory. The size and importance of the material itself combined with ongoing developing technology and dated digital research infrastructures, working both for and against the purpose, made the issue an ambitious yet challenging project (Markou 2017). As the project is currently in progress, there is no link available. More generally, the yearly updated document for Digital Research Infrastructure Roadmaps in Greece is largely focused on ICT, science and engineering, but broadly allocates the humanities and social sciences in the line of DARIAH and CLARIN (https://ec.europa.eu/research/infrastructures/pdf/roadmaps/greece_national_roadmap.pdf). 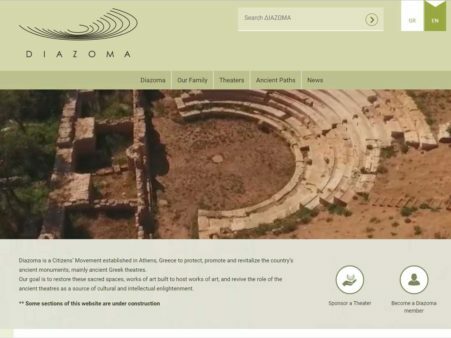 In the same breath and under the larger frame of Information Society, Odysseus (www.odysseus.culture.gr ), a webspace run by the Greek Ministry of Culture and Sports, was designed to include webpages or links to the websites of all archaeological sites, state museums and other state heritage spaces. The website, which has been recently updated, is representative of current digital research interfaces in Greece. It is a repository/directory for heritage space, including pages related to all state-run archaeological sites and museums, a digital collections section (note 5) and a special issue section, concentrating on scholarly work on key elements of the current Greek national heritage agenda, precisely concentrating at this moment on classical Greek artefacts (the Olympic games, the Parthenon Marbles). Following Odysseus, Greek state-owned museums, launched their own websites. From 2005 onwards, all major Greek archaeological museums and their Byzantine or thematic counterparts have an important yet minimal or, rather, conservative interface and online presence. Since recently, most museum websites contained general info on each museum’s history, collections and educational activities and specific thematic categories (e.g. focus on conceptual exhibitions or special artefacts) but, so far, they mostly lack detailed open access, open source databases as with, for example, the British Museum (note 6), or advanced virtual tour applications. Greek private heritage institutions (museums, heritage-supporting Non-governmental organizations) offer a slightly different picture incorporating advanced digital technologies earlier than state initiatives. Since 2006, the Foundation of the Hellenic World operates its Tholos, a dome-shaped Virtual Reality Theatre which hosts the Foundation’s digital collections but also its 3D productions. The shows are envisaged as “interactive, controlled by the spectator, and not static”. They are described as “a unique experience of immersion into the virtual world, which is characterized by immediate response, flexibility, originality and liveliness.” (note 7). At the same time, virtual walks on ancient sites had been made possible through the Foundation’s website. The electronic library of the Latsis Foundation serves equally as a virtual museum guide (note 8). With the similar scope to communicate different aspects of Greek material and intangible culture to an ever-demanding audience, Greek NGOs, people’s movements and culture societies have been incorporated diverse digital media to their mission from a very early stage, pioneering the field. Well before other similar initiatives focused on world heritage in danger, the Hellenic Society for the Environment and Cultural Heritage (Ελληνική Εταιρεία Περιβάλλοντος και Πολιτισμού) had launched the Monuments at Risk (ΜυΑ) Project, where, combining crowdsourcing and digital heritage documentation, laypeople are encouraged to report and enter info on Greek monuments in danger through an online, open access platform (note 9). The Society also uses its main domain for communicating crowdsourcing initiatives and other projects focused mostly on the field of sustainable cultural heritage management (inauguration of cultural paths, saving monuments hurt by natural causes, e.g. earthquakes etc). 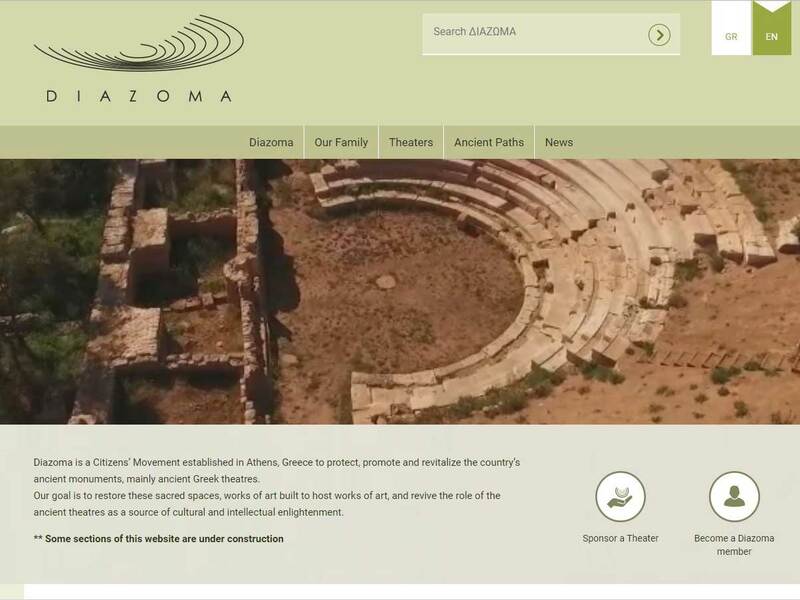 In the same style, Diazoma, the main private initiative to save and document ancient theatres, has launched a complete online list of documented theatres (note 10). The initiative’ s online resources also include a list of proposed cultural paths and an online library. The landscape seems to change, however as private and state museum websites are currently and gradually enriched with an array of technologically advanced digital resources, such as virtual tours and artifact catalogues. For example, the website of the (state-run) Byzantine and Christian Museum in Athens (note 11), offers a virtual tour and online games among others, while the (honored with an EMYA Award by the European Museum Forum, note 12). Archaeological Museum of Tegea features virtual tours not only for the museum but also for different archaeological sites in its area (note 13). Among private museums, the Benaki Museum owns a state of the art website which, through an advanced virtual tour, videos, web applications, and a detailed catalogue of documented and digitized artifacts enables browsing through vast museum collections. These collections represent a number of geographical regions, cover chronologically from the prehistoric times until the modern era and are held in seven different venues (note 14). On the same length, the online presence of the Museum Network of the Piraeus Bank Group Cultural Foundation, focusing on Greece’s industrial heritage, is part of a holistic approach supported through a portal hosting online archives and publications as well (note 15). What does the future hold for digital cultural repositories in Greece? Technological advances and the ongoing progress seen on current projects show that, although challenges continue to prevail, there is, and will be, significant progress made. As of 2017 the digital policy of Greece has been discussed at the Conference for Digital Strategy (May 2017) (note 16). More precisely, the last session was about “The Digital Integration of Greek Culture and Tourism as an Economic Development Opportunity”. Delphi Economic Forum II: March 2-5, 2017, SESSION: Cultural heritage as economic value: Economic benefits and social opportunities, mentioning the digital aspect of culture. With regard to the Greek portable antiquities digitization project currently running through the EPAnEK O.P., the plan initially foresees the updating and upgrading of the Information System of the Greek National Monument Archives, aiming to: a) take full advantage of the opportunities offered by web-based, server consolidation and other technical elements, b) incorporate updated data and metadata complements and c) meet modern interoperability requirements with other systems (e.g. Archaeological Cadastre). The main objective is described as “creating a user-friendly environment in order to consolidate its use as the primary tool for recording, documenting and managing the monumental wealth of the country. The development of the National Monument Register, which will contain the common information that applies to all monuments (portable and immovable) as well as thematic documentation bases for coins and inscriptions, has been described as the project’s initial task (note 17). At the same time, different ongoing programmes incorporated within heritage spaces of state nature are driven to give the public the opportunity to digitally access them via Virtual Reality and Augmented Reality. Such examples are set through the E-Castles platform (note 18), and most importantly the holistic approach to the ancient environment given by different applications in the site and Polycentric Museum of Aigai (note 19), some of which are completed while others have been announced for the near future. The latest example of such initiatives is given through the ongoing project Crete 3D, materialized by the Technical University of Crete (note 20). The foreign archaeological institutes of Greece make use of digital platforms in order to help researchers and students access artefacts remotely. While we here restrict ourselves to a limited number of examples it is worth noting that databases and platforms may or may not reposit digital versions of the artefacts in multiple platforms. For example the Swedish Institute’s database Pragmata (note 21) offers human-readable content only. The British School of Athens, on the other hand has its own digital repositories. Archive is the official repository for the records of the British School at Athens and documents the history and activities of the School from its founding in 1886 to the present. The Archive Collections include: Excavation Records, Personal Papers, the BSA Corporate Records, the Byzantine Research Fund, and the BSA Photographic Archive. It is clear from the website’s interface that findings further connect with other repositories (e.g. CLAROS). Other EU multinational funded projects work in collaboration with location based digital tools and are directed toward citizen science. For example, the project Emotive, a multinational and polyfocal ERC financed project including the Athena Research and Information Centre in Information and Communication Knowledge seeks to elicit emotional responses of site visitors through digital technology (note 22). The emergence of social media during the last 15 years has widely transformed the way the public and the private, as well as the official and unofficial are called to interact, bringing enormous changes to the way arts and science procedures are communicated to the public (Richardson 2014). The former had tremendous effects to the mission and activity of museums as the primary foundations designated to communicate archaeological knowledge. Museums worldwide responded to the possibilities social media gave for interaction with their public, adopting management strategies through channels suited to their needs and audiences (Marakos 2014). Two years on, it is notable that many more Greek Museums are active on social media (note 23). Private museums, such as the Benaki Museum, the Museum of Cycladic Art, and the semi-state Acropolis Museum maintain their active presence within their accounts on Facebook and also on Twitter and Instagram, running each one of them with a particular strategy that allow them to communicate their activities in a constructional way. In that framework it is worth mentioning the example of the Acropolis Museum, which held its own digital Instagram collection entitled “My Samothraki Exhibition”: a blending of portrayals of both tourist experience and archaeological findings (note 24). State museums, (the National Archaeological Museum of Athens, the Byzantine and Christian Museum, and the Museum of the Royal Tombs at Aigai, the Archaeological Museum of Igoumenitsa and the Archaeological Museum of Ancient Eleutherna, to mention a few) currently maintain and curate Facebook accounts. Activity and content management quality varies and it is not necessarily interactive; it is a one-way-communication (Fletcher and Lee 2012; Capriotti and Pardo Kuklinski 2012). However, it is still museum produced original content. Overall, Facebook remains the most popular social media channel; few museums (e.g. The Archaeological Museum of Thessaloniki, Archaeological museum of Tegea) maintaining accounts on Twitter. Curator and other museum professional blogging is conducted on the websites of the National Archaeological Museum of Athens (note 25) and the Benaki Museum conservation department (note 26). Additionally, museums hold a strong presence on Youtube and Vimeo. For example, the National Archaeological Museum page hosts videos relevant to their Odyssey exhibition and the Invisible Museum activity). Concluding, it is worth observing that the Greek Museums’ social media presence is an ongoing process. While there is still a long way to go regarding curating and communicating museum activities on channels in use in the way demonstrated by similar institutions abroad, the dynamic activity of the past two years on behalf of Greek museum people, who seem to embrace modern ways of communication, adding their archaeological expertise and eagerness for personal growth (e.g. advanced language and technological skills) makes Greek Museums’ social media activity seem promising beyond expectations. Thus far, we have discussed digital platforms for Hellenic archaeology and cultural heritage. It seems like there is significant progress made in terms of both private and public sectors in the last decade. Museums and archaeological institutions engage with social media and are directed towards both innovative digital tools for citizen science, as well as maintaining digital research infrastructures. While the future seems bright, manual cataloguing practices need to be updated; Artefacts need be described consistently, in order to then be added to digital platforms and databases. Platform and tool maintenance is key for making artefacts open access/online. Most importantly, there is an urgent need to upgrade and to sustain digital state infrastructures in Greece and beyond (Foka et al 2017). While the national land registry still needs to be clarified and defined by rules so as to facilitate the work of archaeology in Greece, collaboration of the local archaeological teams with foreign institutes seems to ameliorate the registration of artefacts as well as their placement in digital repositories. Ongoing collaborative work with private stakeholders and the foreign institutes further guarantees knowledge exchange for the preservation and dissemination of Hellenic cultural heritage. 23. In this study we browsed the accounts of the museums examined by Theochari et. al in 2014 as well as the ones of: the National Archaeological Museum of Athens (https://www.facebook.com/namuseum/ ), the Archaeological Museums of Herakleion (http://bit.ly/2udogCF ), Chania (https://www.facebook.com/archaeologicalmuseumofchania/?fref=nf ) and Igoumenitsa (http://bit.ly/2hzzpMb ), the Numismatic Museum (https://www.facebook.com/NumismaticMuseum.Athens/), the Byzantine and Christian Museum (Athens, https://www.facebook.com/byzantineandchristianmuseum/), the Museum of Byzantine Culture (Thessaloniki, https://www.facebook.com/mbp.thess ), the Museum of Ancient Eleutherna (https://www.facebook.com/museumancienteleutherna/), the Museum of the Royal Tombs at Aigai (https://www.facebook.com/aigai.museum.vergina) and the (private) Benaki Museum (https://www.facebook.com/TheBenakiMuseum/). All pages’ links given as seen on Aug. 6, 2017. 26. Μουσείο Μπενάκη, Τμήμα Συντήρησης, https://benakiconservation.com/. Last access date: 6/08/2017. Betts, E. 2011. “Towards a Multisensory Experience of movement in the City of Rome”, in Laurence, R. and Newsome, D. (eds. ), Rome, Ostia and Pompeii: Movement and Space, Oxford University Press, Oxford, p. 118-32. Betts, E. (ed.) 2017. Senses of the Empire, Bloomsbury, London. Capriotti, P., Pardo Kuklinski, H. 2012. “Assessing dialogic communication through the Internet in Spanish museums”, Public Relations Review 38.4, p. 619-626. Fletcher, A., Lee, M.J. 2012. “Current social media uses and evaluations in American museums”, Museum Management and Curatorship 27.5, p. 505-521. Foka, A., Arvidsson, V. 2016. “Experiential Analogies: Sonic Digital Ekphrasis as a Digital Humanities Project”, Digital Humanities Quarterly 6:10:2. Foka, A., Misharina, A., Arvidsson A., and Gelfgren, S. 2017. “Digitalized Infrastructures: Towards a viable socio-spatial model for Arts and Humanities”. Digital Scholarship in the Humanities, Oxford University Press. Forte, M. (ed.) 2010. Cyber Archaeology, BAR International Series 2177, Archaeopress, Oxford. Gronemann, S.T., Kristiansen, E., Drotner, K. 2015. Mediated co-construction of museums and audiences on Facebook, Museum Management and Curatorship 30.3, online citation DOI: 10.1080/09647775.2015.1042510 as in http://dx.doi.org/10.1080/09647775.2015.1042510 . Last access date: 6/08/2017.